Special thanks to today’s guest scriptwriter: Tariq Ramadan. Clearly in the aim of the beholder. …but not in the Boulder? I’ll have a couple of pointed stones please. And a nice flat one. C’mon Brian, we’re going to be late for the stoning!! As another great comic profaner, Eddie Izzard, said: “If you are religious, that’s OK, but you’ve got to keep analysing it, and keep a sense of humour, because without a sense of humour people start dying.” Especially if the ones without the sense of humour have stones. Also the mote in your neighbor’s eye, the log in your own. If we dropped the right bomb all of these clowns would live in glass houses……. mo’s revelations are as clear as a muddy pond. I guess that’s the ultimate strategy to have it both ways. euhhh, Mo is such a typical poseur! He knows he can’t give a definitive answer without exposing himself as a complete fraud! Jesus, on the other hand, knows this and so assumes he is safe from exposure of equal fraudulence because Mo is going to wriggle on the hook so beautifully. Great strip Author. Isn’t Tariq Ramadan just inspiring? Good intended both of them, surely. But that is no enough. Some people regard themselves as a “without sin” and some people have “clear answers”. 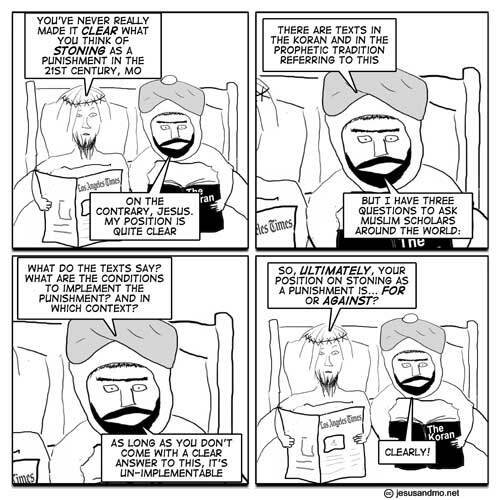 International blasphemy day is fast approaching and people might want to think about participation. Exactly, Didac. There are folks who look at the Bible and Koran and see precisely what they want to see. When I was a Christian, I cherry-picked my own doctrine and ignored the rest. When I finally realized that not only I but every other Christian I knew was doing it… That’s pretty much when I stopped being a believer. For someone who’s not political, he certainly has the ‘non-committal’ and ‘tailored for the audience’ tactics well in hand. Sorry J&M, but isn’t this Tariq Ramadan bloke a bit of a shady character? He’s a very shady character; I rather think that’s why he’s being made mock of. Hey, it’s Friday, that’s a perfectly good excuse! Tariq Ramadan was quite well known in the UK media a few years ago. He was taken uncritically as a moderate voice of Islam until very recently, appearing on mainstream serious news programmes without question or criticism, though he seems to have slipped out of the limelight in the last year or two. – note the ‘moratorium’ – not a repeal or rejection, just a suspension of its implementation. He’s also known for being the grandson of Hassan Al-Banna, founder of the Muslim Brotherhood, the Islamic radical movement that gave birth to al Qaeda and Hamas. ot: This deserves a take!! 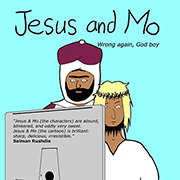 Mo and jesus are gonna like it. And, I know, your job couldn’t be easier here.